St. Radegund was a 6th-century Thuringian princess and Frankish queen, who founded the Abbey of the Holy Cross at Poitiers. 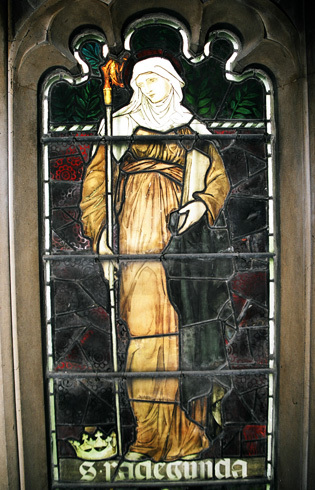 She is the patron saint of several churches in France and England and of Jesus College, Cambridge (whose full name is "The College of the Blessed Virgin Mary, Saint John the Evangelist and the glorious Virgin Saint Radegund, near Cambridge". Radegund was born about 520 to Bertachar, one of the three kings of the German land Thuringia.Radegund's uncle, Hermanfrid, killed Bertachar in battle, and took Radegund into his household. After allying with the Frankish King Theuderic, Hermanfrid defeated his other brother Baderic. However, having crushed his brothers and seized control of Thuringia, Hermanfrid reneged on his agreement with Theuderic to share sovereignty. In 531, Theuderic returned to Thuringia with his brother Clotaire I. Together they defeated Hermanfrid and conquered his kingdom. Clotaire I also took charge of Radegund, taking her back to Merovingian Gaul with him. He sent the child to his villa of Athies in Picardy for several years, before marrying her in 540. Radegund was one of Clotaire I’s six wives or concubines (the other five being Guntheuca who was the widow of his brother Chlodomer, Chunsina, Ingund, Ingund’s sister Aregund and Wuldetrada the widow of Clotaire's grand-nephew Theudebald). She bore him no children. By 550 Radegund's brother was the last surviving male member of the Thuringian royal family. Chlothar had him murdered. She fled the court and sought the protection of the Church, persuading the bishop of Noyon to appoint her a deaconess; founding the monastery of Sainte-Croix in Poitiers circa 560. Living under the Rule for Virgins of Caesarius of Arles, the nuns were required to be able to read and write, and to devote several hours of the day to reading the scriptures and copying manuscripts, as well as traditional tasks such as weaving and needlework.This Rule strictly enclosed women, to the point that nuns of Sainte-Croix were unable to attend Radegund's funeral. Her abbey was named for the relic of the True Cross that Radegund obtained from the Byzantine Emperor Justin II. Although the bishop of Poitiers Maroveus refused to install it in the abbey, at Radegund's request king Sigebert sent Eufronius of Tours to Poitiers to perform the ceremony. To celebrate the relic and its installation into Sainte-Croix, Venantius Fortunatus composed a series of hymns, including the famous vexilla regis, considered to be one of the most significant Christian hymns ever written, which is still sung for services on Good Friday. Radegund was a close friend of Junian of Maire; Junian and Radegund are said to have died on the same day, August 13, 587.